Snapshot has an amazing new Code Quality Report that can identify many common programming flaws in any Apex Class. You can schedule the Code Quality Report to run after any Snapshot and send a PDF, CSV, or HTML file to admins or developers with all of the various problems that were found. Super admins can even set up a Code Quality Gateway to prevent selected programming problems from being deployed to any org! Let’s dig in and take a look at this new capability. We have simplified the PMD installation process as much as possible. The first tab of the Apex Code Quality dialog has a button at upper right called “PMD Connection.” Click that button, and there will be various links and information about how to install PMD. When you are ready, click the “Test Installation” button, and Snapshot will tell you if PMD is installed or not. You can also return to this screen and update the version of PMD that you are using. The path to the current version is in the pathname above the button. Once PMD is installed, you can right-click any Snapshot item and select “Apex Code Quality” from the popup menu. You can also use the Options Menu at the top of the screen. The dialog below will appear, and you can see all of your Apex Classes at left. Click on any class name and the middle section will show you various problems with the code. You will see the Rule Set and Rule that was violated. Scrolling to the right, the report details the seriousness of the problem, the impacted line numbers, and a detailed explanation of how to fix the issue. Click on any rule and the lines of code that are causing the problem will be highlighted at right. This first tab provides an easy way to quickly preview all of your Apex Classes and review any code problems. You can click down the list of issues and see all of the affected lines of code at right. Right-click the center table to export all of the problems as a CSV, HTML, or PDF file. If you check multiple Apex Classes at left, then all of the selected items will be included in the final report under the middle tab. Each category contains different rules. There are about 45 different rules that PMD uses to analyze Apex code. A full description of each rule is documented in the Snapshot interface. Each rule is assigned a number between 1 (highest priority) and 5 (lowest priority). The priority numbers for each rule can be assigned in the Snapshot interface. In this manner, you can decide what rules are the most critical or least important. Rules can also be removed from consideration completely if desired. Right-click the center report on the first tab or click the “Manage Quality” button on the second tab to assign each of the available rules a priority. In the example below, we have assigned rules regarding Code Style and Best Practices to be optional, while rules regarding Security and Performance are absolutely required. If there are some rules that you would like to ignore entirely then uncheck the “Include Rule in Report” checkbox. Just like other reports in Snapshot, you can schedule and automate the Code Quality Report. In the last tab, select the event to trigger the report, and then send a PDF, CSV, or HTML file to an email list or Chatter group. Alternatively, the report could be saved to Salesforce Content or a local folder. 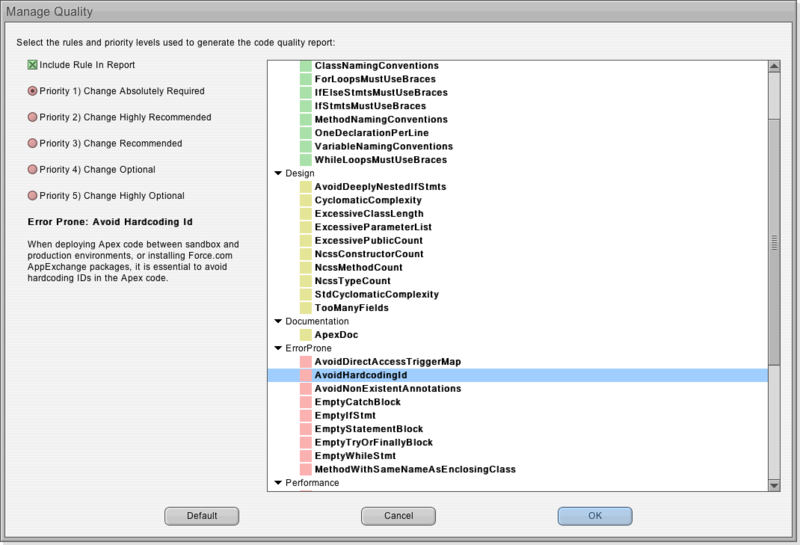 Code Quality Reports can be conditional, and only sent out if changes are required in the code. In this manner, any org can be monitored for code quality, and a full report is generated and delivered if there are problems. There you have it. 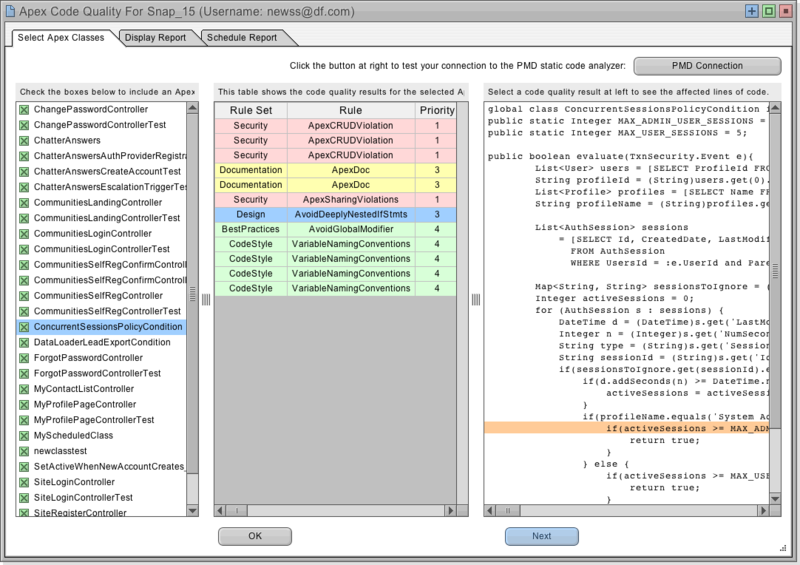 Snapshot now has a state-of-the-art code quality analysis and monitoring system. Be sure to give this new feature a try and let us know how it works for you.